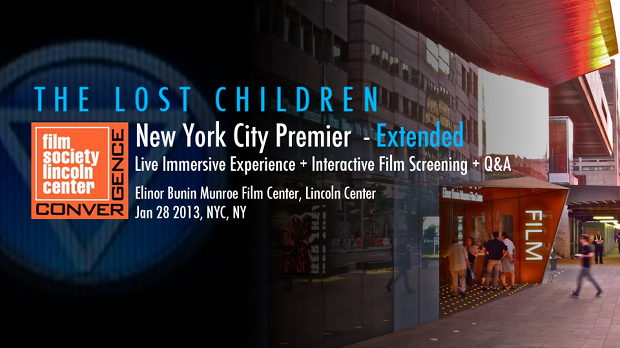 My feature film The Lost Children will have its New York City premiere with the Film Society of Lincoln Center in January, 2013. The premiere will not be a film screening alone. It is presented by Convergence: Film Society of Lincoln Center, which is an arm of the FSLC devoted to immersive and transmedia storytelling. Like many organizations in New York City, FSLC is reaching out and exploring new storytelling methods. The 50th anniversary of the NYFF included its first ever series of panels on transmedia. This year, the Tribeca FF is accepting basically any type of project. And the IFP recently won a bid to run the upcoming NYC Media Center, which will house a blend of film+art+technology. And fellow Filmmaker contributor Lance Weiler even has a transmedia curriculum at Columbia University now. Convergence: FSLC is billing this not as a NYC premiere of the movie, but as the NYC premiere of the story world. I love this idea and it’s the first time I’ve seen it. So the premiere is not just about coming to see a film, it’s about coming out for a whole evening of exploring the story world, with the film being one aspect of that exploration. The premiere will consist of three parts which coincide with three aspects of the story world. In the coming weeks, I’ll be writing articles here about each aspect, and then when it’s over, I’ll contribute a post mortem, sharing what I learned from the whole experience. Part 1: A live immersive theater experience that places the audience directly into a cult recruitment event. The story involves a cult, and the film is the story of one young woman escaping the cult. The goal here is to use theater to affect the audience directly, and to demonstrate in a visceral, real way, some of the techniques cults use to recruit people. It’s not a play about a recruitment event, it’s an actual recruitment event. I’ll talk more about ideas around immersive theater, empathy, etc. in the article devoted to that. Part 2: A live lecture and Q&A about the real science aspects of the film. The Lost Children cult believes they are from another world, and soon will leave Earth by way of a UFO hiding within the Tioga Comet. So this section will be lead by a real astronomer or science writer and explore the real scientific aspects of comets and the search for alien life in the universe. As a life-long lover of science, the goal here is to use the fictional elements of my story as a jumping off point to explore real science. The Physics of Star Trek does the same thing. Plus, many astronomers credit Science Fiction as inspiring their careers in real science. Audience will be allowed to go between Part 1 and Part 2 at will. Part 3: An interactive screening of the feature film itself. For a long time, I’ve liked the idea of films reacting to each night’s audience, similar to a live performance. I talked about a version of this at UCLA in 2011. We’re trying another variation here. The audience will be allowed to to indicate their feelings in a very non-disruptive manner, and the film will alter itself in reaction. Those who want to just watch a film will be able to do that uninterrupted. But the film they see will be only one variation possible. I’m toying with the ideas of releasing each version of the film when we do VOD. The goal is to experiment with a concept called “film as software.” Which means basically film taking on some of the characteristics of software, one of those being the ability to react to users in real time. I want to emphasize, this will not be a “choose your own adventure,” and it will not be an incoherent dive into video art. As I said, those who want to just sit back and watch a (hopefully) good movie, can do so. I think this principle of not forcing people to “interact” is key in designing any interactive experience and it’s a principle I extend through the entire evening. There are always multiple levels and you can choose the one that suits you best. Over the next few weeks, I will detail each of these pieces and delve deeper into the whats and the whys. But in this first article, I wanted to walk a bit through the thought process that lead me to do this at all. I’ve had to think about all of this a lot, and I came up with a couple of things. The first and foremost reason for this is that I think it’s very cool and provides a compelling experience for the audience. I came from live theater and have always loved it. I also love the growing movement of immersive theater. And when I sat back and thought about it, all of the most amazing experiences I’ve had over the past few years have been live experiences, some of them immersive. So I think this is simply an amazing idea for an evening, and it gives me the opportunity to create and explore the world around my film in some new and very interesting ways, while moving the audience in some powerful ways. It also allows me to work on some aspects of transmedia design, such as designing for different levels of interaction. Finally, it gives me the opportunity to collaborate with people across disciplines I never would have imagined. The astronomer, for instance. Likewise, I’ve partnered with The Institute for Art and Olfaction in L.A. to provide a custom scent for the experience. This scent will be used to help cement emotions and memories in the audience’s minds. I’ve thought about this one for a long time. This kind of event costs money to produce. Any live event does. Can money be made on this? I think ultimately the answer can be yes, with a few qualifications. Just as in movies, there is very little money to be made in theater, unless you are going to stick to some formulas. A musical based on a big Hollywood movie is a good one. From Lion King to How to Train Your Dragon, these shows make money. Then you have Cirque du Soleil, which turned the circus into a kind of narrative acrobatic ball of amazing, and can’t seem to sell tickets fast enough. I’m pretty sure they make a lot of money. There are productions like Sleep No More. Sleep No More has a lot of repeat business. About half of my immediate circle have been more than once, and I know one person who’s been five times. It’s almost more like a haunted house, or an amusement park model, than a “theater” model. Now, I don’t know if Sleep No More makes money or not. I’d read early on that it had cost in the millions to mount, and it has to be very expensive to maintain, with the real estate, the constant upkeep, talent, etc. There are two options for my experience. One would be to use it as a promotional event, driving digital sales of the film, which are much more scalable. Maybe do this event in a few cities like Austin, L.A., Portland, to build buzz. I don’t have a problem with that. No movie is successful without spending money on promotion. And I like the idea of spending that money to create new art, rather than spending it on posters and stuff. And I feel like it’s a good way to stand out in an increasingly crowded landscape. The other option is the one I’m shooting for first. Templatized live events. Send this whole event on tour. This would mean partnering with live theaters around the country, provide a script for the live portions, a guide to hosting the science portion, plus a copy of the interactive version of the film, similar to what you do with a play. Then arrange some kind of revenue split. 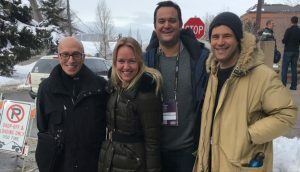 In my professional transmedia business, I’ve recently heard a couple of big organizations leaning toward more involved live events as a way to attract customers and give them more reason to leave their home entertainment systems. Even the Discovery Channel has a “museum” in Times Square which serves as a destination for its viewers coming to NYC. So this isn’t that weird of an idea, really. I’ll explore this more in the upcoming article on live immersive events. Finally, more and more I don’t silo aspects of my career. Each piece feeds the others. Film feeds software. Software feeds film. Software feeds theater. Theater feeds software. And the more I work in transmedia professionally, the more benefit there is to me using my own projects to incubate ideas. Crazy ideas lead to knowledge I can use on client projects, which leads to income. I don’t consider my client work my “day job”, but as another part of my overall career. Frankly I find the term “day job” very out-moded. I like writing software. I like making movies. I like designing live experiences and writing plays. So I am less concerned with each project earning profit, than I am with my career as a whole. Indeed this is nothing new to independent filmmakers, whose first big success may mean more to their careers than to the actual return to their investors. Special thanks Matt Bolish & Film Society of Lincoln Center, StoryCode, IFP, Lance Weiler, Adam Neuhaus & Julia Pontecorvo @radical.media for always supporting my work. I’ll thank more of you as the articles run on. I’m only at this point due to the constant support of many in the film/theater/Transmedia communities. Premiere Jan 22nd sold out. Another show added Jan 28th.